The rains came back this morning. Fortunately, they didn’t last long and we were able to get out of the campground without getting too wet. 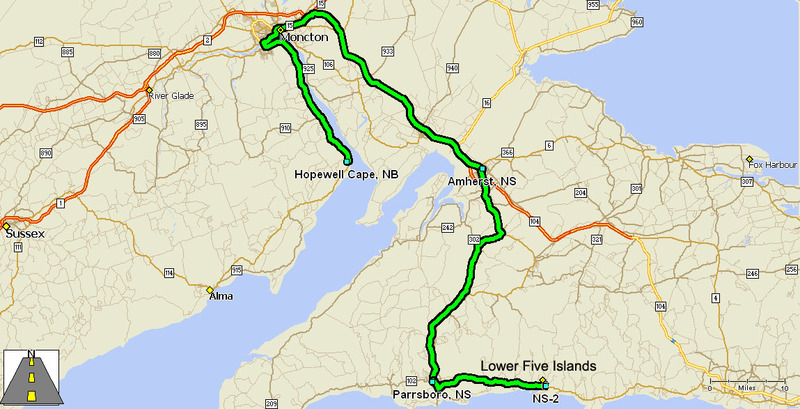 The drive to Lower Five Islands was relatively easy. The only part that concerned me was the section through Moncton, but even that turned out to be OK. Once we got into Nova Scotia and off the major highway, it got kind of interesting passing through small towns until we got to the thriving metropolis (just kidding) of Lower Five Islands. At least the weather cleared up for a while and the temperature reached a muggy 72 degrees. This evening the rains returned and the temperature is dropping. The campground is in one of the most beautiful settings we have been to in the last three years. We are on a bluff overlooking Minas Basin, an arm of the Bay of Fundy. When we got here, the tide was going out and the rocks directly behind across a stretch of water from us were still awash. 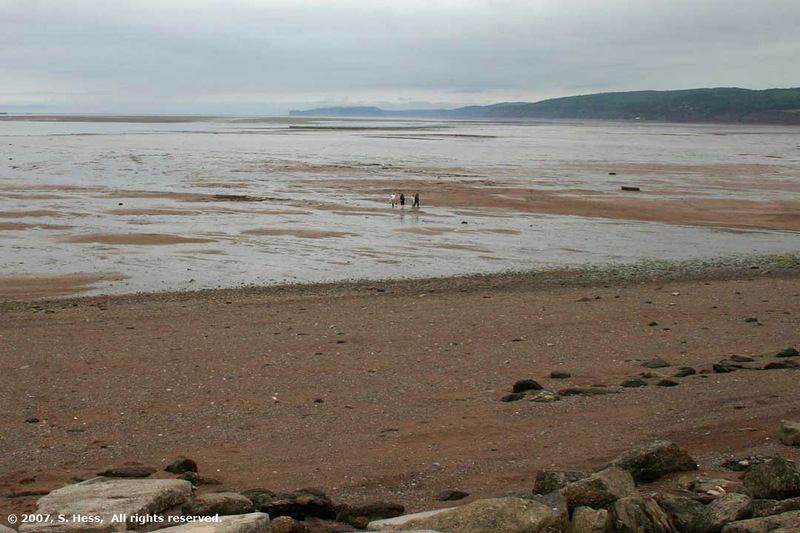 We went out for a while and when we came back the tide was nearly at its lowest level. The rocks were just sitting in the flats (see pictures below). Our neighbor, a New Brunswick resident who comes here frequently, told us that at low tide you can walk to the largest of the five islands. She also said the tide difference here can be as much at 55 feet. I went for a walk on the flats… they are gravel for a couple of hundred feet and then turn to mud. 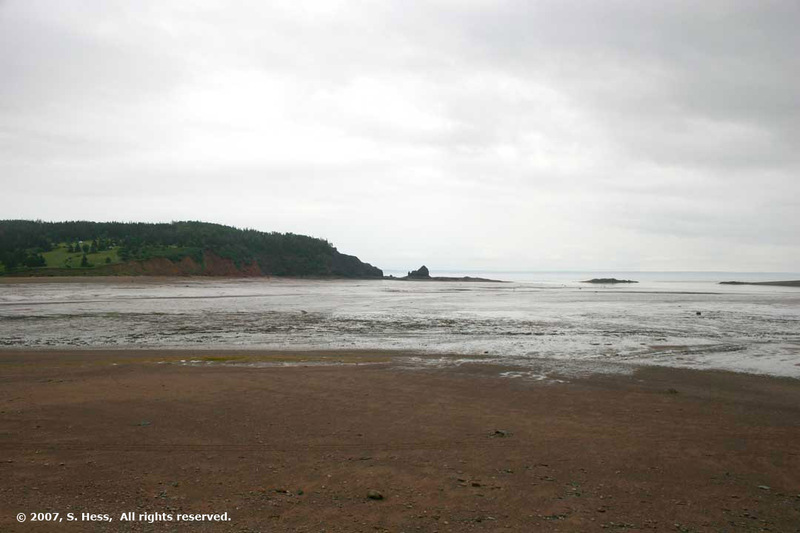 The mud is where the people congregate at low tide to dig up clams for their supper. Our neighbors had a couple of buckets full in a relatively short period of time and were going to steam them, along with lobsters they got directly from local fisherman, for their dinner. I would have accepted their invitation for dinner, but they didn’t offer one. The down side of being in this beautiful but isolated place is the lack of communication. There is no Internet short of a dial up line in the office and cell phone service is spotty, at best. In our 2005 trip to Alaska we had Internet service in more isolated places than this one. I would have thought that in the intervening two years, places like this would have had high speed Internet installed. So be it… I will get this page uploaded whenever I find an Internet connection. 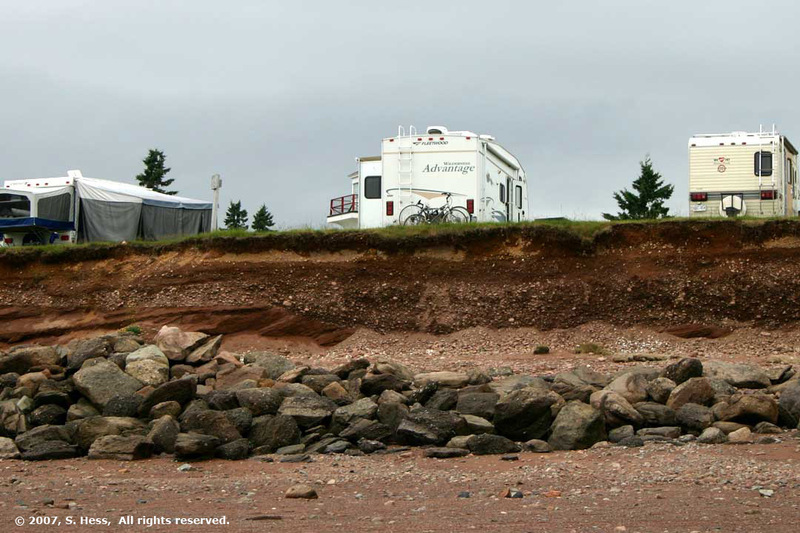 A panoramic view of the scene unfolding behind our trailer at Sand Point. Click on the picture to open in a new window and enlarge the image. Almost low tide. Note that the rock in the center of the picture is more exposed than in the picture above. At low tide, the group of rocks is completely above the water line. 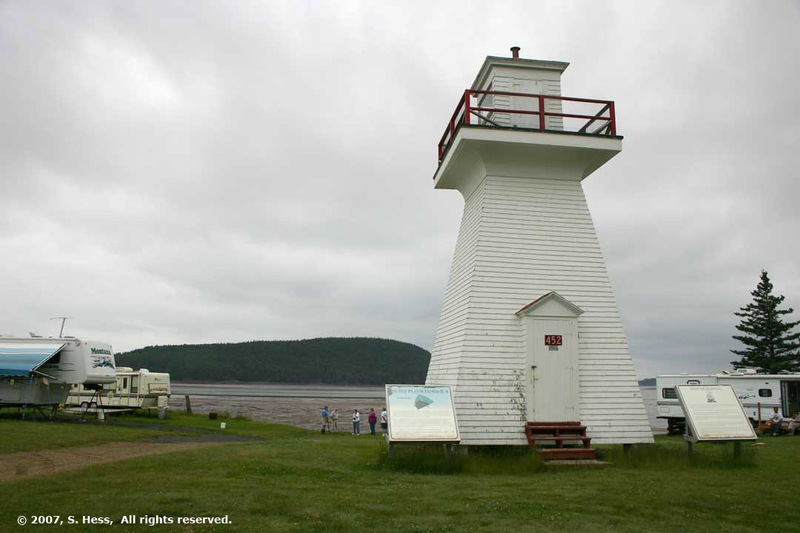 Five Island Lighthouse is located right on the campground. It was built in 1914 and operated until 1993. The lighthouse was moved three times since it was built, as the bluff on which it stood eroded away.